Project Increase Ministries - projectincrease's JimdoPage! 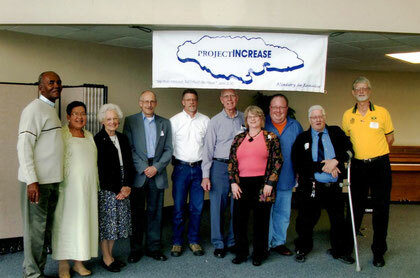 This picture is the project increase board at our Annual Banquet in April 2011. Our special guests were Pastor Delroy Campbell and his wife, Jeanette. Robins Nest Orphanage - A privately funded Christian Orphanage in the mountains outside of Montego Bay. Click Here for info. Team Jamaica - A Short Term Missions Organization specializing in hosting evangelism focused mission teams on the Island. Click Here for info. Jamaica Missions - A Missions sending group based in Central Minnesota, organizing and sending up to 10 teams each year of with a variety of focuses. Click Here for info. New Beginnings International Training Center - A Jamaican based Training Center for young persons from difficult circumstances. Click Here for info. Teamwork Associates - A Christian School and Church in just outside of Montego Bay. Click Here for info. OSDJ (Office for the Strategic Development of Jamaica) - Click Here for info.